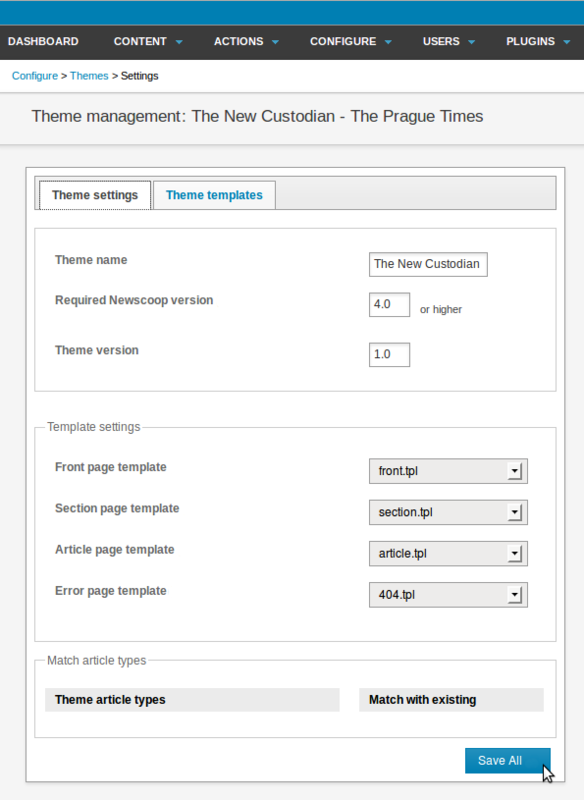 The Newscoop administration interface includes a theme management and template editing tool, which you can find by clicking Configure on the main navigation menu, then Themes. 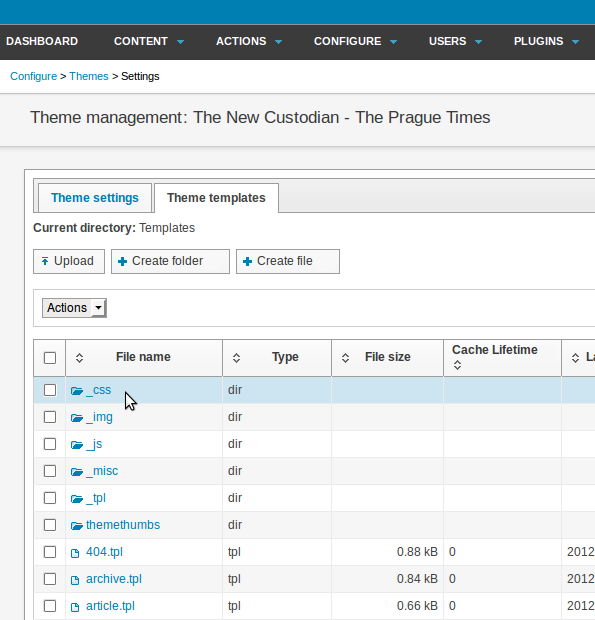 This action will open the Theme Management page, displaying a table with the available themes. Each of the current publications has a corresponding tab at the top of the table, for example "The Prague Times". Click this tab to see a list of the themes assigned to the publication. When a theme is assigned, a separate copy is made so that it can be modified independently of the original. On the right side of the table row for the assigned theme you wish to modify, click the Actions menu, then Edit. Some of the template files are organized into folders, shown at the top of the table on the Theme templates tab. Clicking on the name of a folder displays the files within that folder. 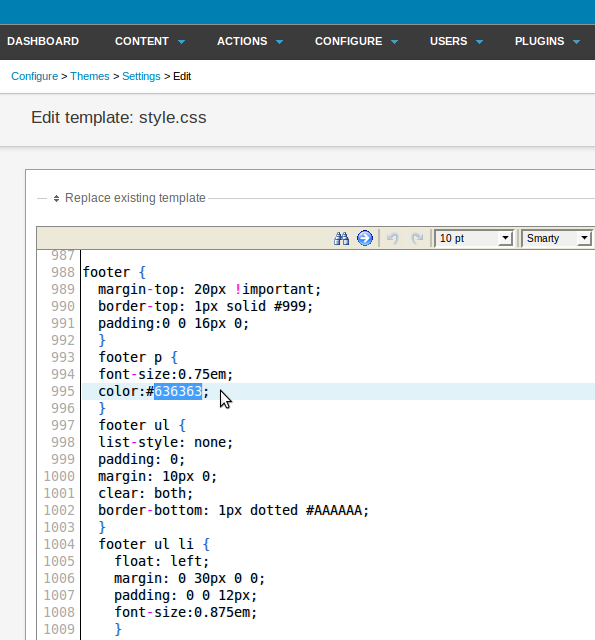 In turn, clicking on a file name opens that file in the template editor. This feature enables you to make quick changes to templates on a running Newscoop system. Alternatively, click Replace existing template to expand a dialog in which a new template can be uploaded from your local machine. You should only make changes to the templates if you know what you are doing, because any modifications will have an immediate impact on the appearance of your publication. This feature is also useful for editing templates on a development server before they are copied to the publication's production server. 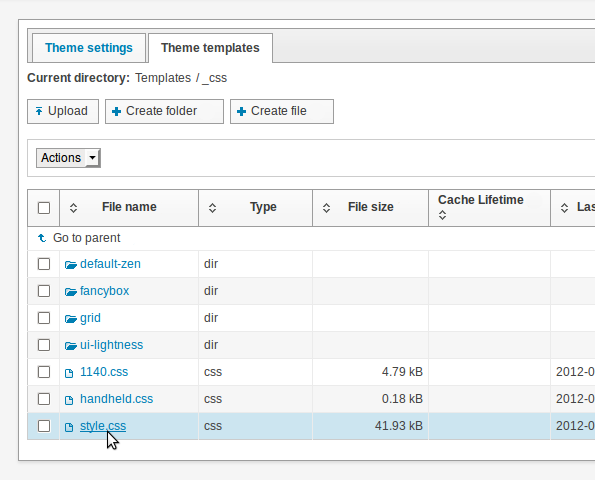 The Theme Settings tab enables you to change the name of a theme, version numbers, or the specific template files used for the four master templates. Like the template editor, this feature should only be used by competent web developers, as it can have an immediate effect on the appearance of your publication. 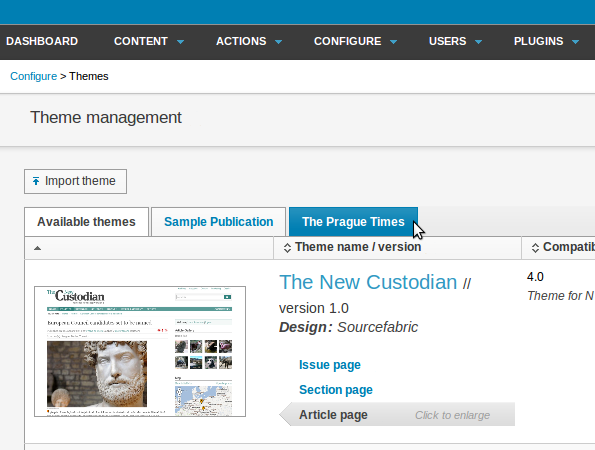 Optionally, themes can define Article Types which you can match to existing Article Types on your Newscoop installation. If the theme defines any Article Types, they will be shown at the end of the Theme Settings tab. See the Article Types chapter in this manual for more details. Because themes assigned to publications are individual copies, it is possible to delete a theme from the Available themes tab even when a copy of that theme is still assigned and in use by a publication.